The latest version of Cakewalk's flagship sequencer brings it into the world of surround sound, makes it easy to work with folder tracks and multiple takes, and adds one of the most comprehensive Freeze functions available on any DAW. It's less than 12 months since Sonar 3 was let loose on the world, but already version 4 is before us. So what can have happened to justify an entire numerical increment? The answer is quite a bit, although the basic core of the program remains the same. What we get is a collection of facilities that makes working with Sonar faster and more streamlined, and also brings the software up to date with regard to multi-channel audio formats. Some features seem to have been inspired by similar elements in other software, but there's no harm in taking ideas from the good things the competition does. Besides, doing so may make Sonar more attractive to anyone looking around for a new sequencing environment. And I can sympathise with potential migrators. My main computer music history has been very much Macintosh-based. I must admit that Cakewalk's approach has always interested me, though I never had much hands-on contact with their software and I often wished they'd make the move to my platform. However, my latest music computer upgrade was a laptop PC, which turned out to be more powerful than the top Powerbook for around half the price. Look around at the most widely used packages on the PC, and bosh: I'm a Cakewalk user! In some ways, then, this will be a review from someone who's coming to Sonar fresh, rather than being written by someone who's used the software since its earliest, pre-Sonar, incarnations. I've only been with the family for a little over a year, and I've been impressed by the cleanness of the design, the integration of virtual instruments, audio handling, MIDI handling, MIDI plug-ins, and all the nice extras that its good to have around 'just in case'. Sonar 's loop- and clip-based audio and MIDI sequencing has made it a hit with the dance and hip-hop crowd, but these features are tidily integrated into a program that excels in any environment where music is required, from home studio to video editing suite. And the developers haven't been distracted by having to maintain incremental Mac OS upgrade compatibility, which seems to be a problem for the cross-platform MIDI and audio programmers. Cakewalk can just focus on making their software work for their chosen platform. The first positive impression I've had from opening a Sonar box is the manual. Not a skinny little installation-and-getting-started booklet, but a fat, well written, fact-packed manual. Not great for the planet's trees, but it sure beats PDF documents for accessibility. What's more, British users who want the full 700-page printed English-language manual, rather than the multilingual (but abridged) European version, can now choose to buy the US version of Sonar 4, or order the manual separately from Edirol UK. Version 4's manual is some 60 pages longer than that supplied with v3, too, which indicates some significant extra material. Sonar is still dongle-free: registration is via serial number and logging on to Cakewalk's web site. As with previous versions, Sonar 4 is available in two flavours, the Producer and Studio editions. Both offer unlimited MIDI and audio tracks, operation at any sampling rate your audio hardware can handle (up to 384kHz and beyond! ), full plug-in delay compensation and sync of all MIDI and audio elements in a session. Internal resolution is better than sample-accurate for audio and virtual instruments, and 960PPQN for external MIDI instruments. Though Sonar can be as linear as you like, it is also very loop-friendly, whether these loops are in audio or MIDI formats, and features a number of specific editing tools that make working with loops easy. It's Acid-compatible, too, and on-board routines make it a doddle to match tempo and play with pitch. Any music you want to record can be done in this environment — I was amazed to see Sonar pigeonholed as a hip-hop/dance environment, when it works perfectly well and elegantly with traditional band sessions, any multi-instrument recording, and even multitrack film soundtrack editing. This session screenshot shows off Sonar 4's new video thumbnail track. 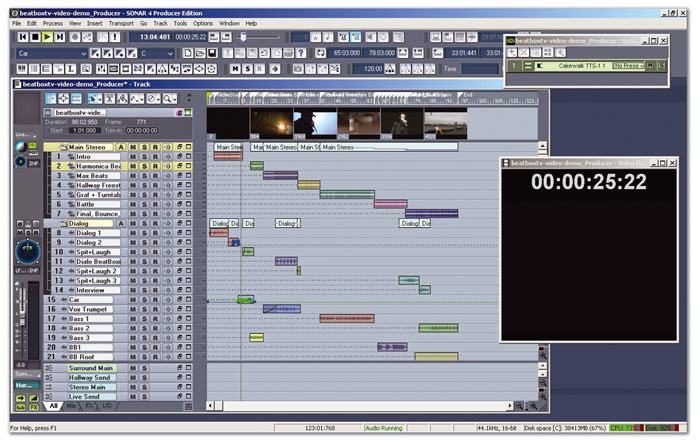 The example session is actually spotting music and sound effects to the video, which is previewed in the large window with the timecode across the top. Editing is both powerful and easily accessible, with user-friendly windows and controls. MIDI data can be viewed as a piano roll or in an event list, score or drum editor. Audio editing is also comprehensive, even if you ignore the Groove Construction window, which lets you slice up audio clips and make them tempo-independent. The automatic process gets you started, but you have full control over where slices go. Practically any third-party virtual synth or plug-in effect can be accommodated in VST and DX formats, and Rewire compatibility means that any Rewire software can be comfortably hosted by Sonar. And you also free soft synths, audio and MIDI effects. The more expensive Producer Edition adds the well-regarded Sonitus plug-in bundle, and now features a video thumbnail track and extensive surround support. The surround sound mixing and monitoring must surely be the king of the new features. It's available in the Producer Edition of Sonar 4 only; surround mixes can be loaded into Studio Edition, but are converted to stereo in the process. Many of us may have no particular need for this option, and the surround hasn't taken off as a music listening format in as big a way as commercial interests would have wanted, but for video games and movie work, it's an essential option. Practically any surround format can be chosen — the software is equipped with fixed templates for many different flavours of the different formats — though your audio hardware may have an impact on what can actually be monitored. 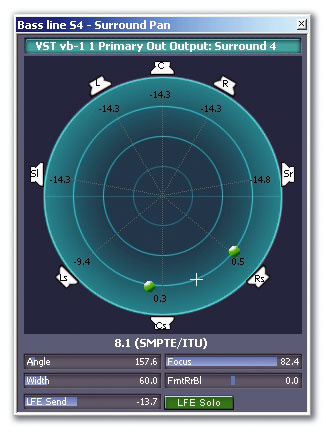 Standard 5.1 surround is the default for surround sessions, but most varieties up to 8.1 are options. Here's what the new surround panner tool looks like when you're working with a nine-channel 8.1 mix. Moving the mouse in the display lets you change angle and focus (that's the crosshair) and width (the two green balls) in an intuitive manner. Your virtual listener is steered between the available audio channels just as easily as if you audio was simply being panned left or right. When you're working in surround, you'll need at least one surround buss — you'd normally be using stereo busses. And no matter which surround format you work in, tracks assigned to the surround buss will be able to be moved in space with the surround panner. This is a logically designed tool that lets you mouse the audio anywhere between a virtual representation of the surround speakers and the channels in the surround buss. Though conceptually a little more complicated than stereo panning, in operation it's easy. It's also possible to use external surround panning joysticks to take over this job. 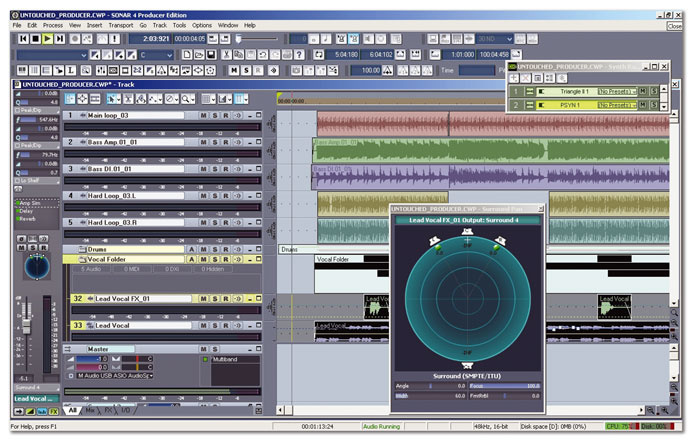 Surround mixing also has implications for other aspects of the software. For example, the bundled Lexicon Pantheon reverb plug-in is now available in a six-channel surround version. Heavy on the CPU, perhaps, but both necessary and worthwhile. Note that while Sonar Producer is capable of mixing more than six-channel surround, Pantheon is not, and will not load if your session is working with seven or more surround channels. 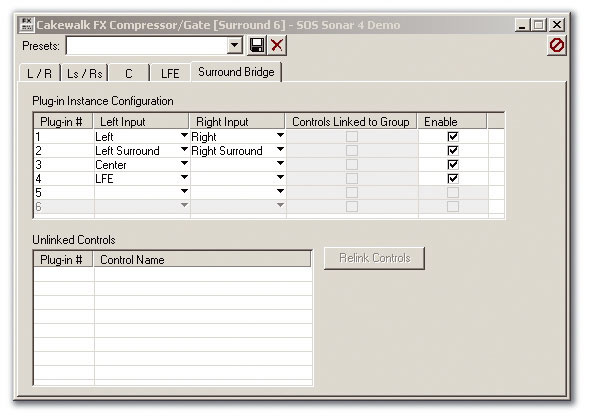 Likewise, the Sonitus compressor plug-in is also available in a new surround configuration. 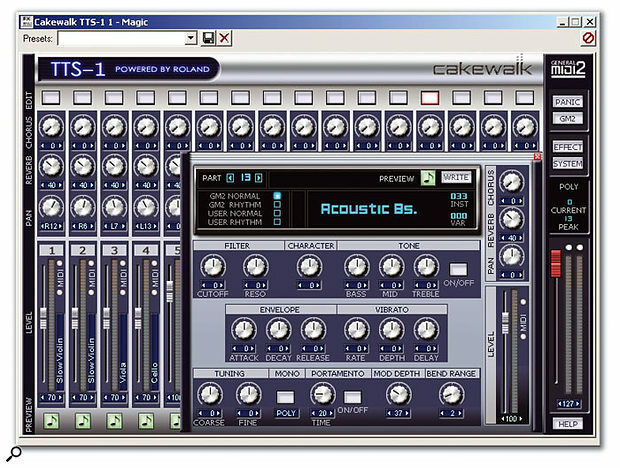 But your non-surround-compatible effects can also come out to play: Cakewalk have implemented what they call the Surround Bridge, which loads enough instances of an effect, whether mono or stereo, to process all the surround channels in you current session. It's possible to link parameters across bridged effects, though you're able to set up different parameters for each instance if that's what's required. You can't, however, use Surround Bridge to set up a true surround compressor, where a peak in any channel triggers gain reduction in all of them — but that's why Cakewalk have included the Sonitus surround compressor. The stylishly designed TTS1 sound module presents a high-quality collection of Roland GM2 Sound Canvas voices and adds user-editability and patch saving. Editing is limited, but enough to customise the sound set to your own tastes or the needs of a given session. 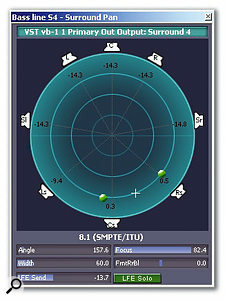 There are no new effects in Sonar 4, beyond the surround-enhanced variants of existing plug-ins, but there is one new instrument. This is TTS1 (above), a multitimbral synth module based on Roland Sound Canvas technology that once again highlights Cakewalk's relationship with Roland offshoot Edirol. TTS1 is essentially a General MIDI 2-compatible module, but its arrival does beg a question: why add TTS1 when Cakewalk were already bundling the VSC Virtual Sound Canvas module with their products? The answer is fairly straightforward: TTS1 is a much more sophisticated plug-in that offers the user much more in the way of control and edibility. It's rather like a Sound Canvas Pro in its approach. VSC 's sound set is rather basic, a bare-bones Sound Canvas. The sounds for TTS1 are much more vibrant, with more multisamples, velocity layering, effects and so on. The presentation is much more slick, too, with a comprehensive 16-channel mixer as a front end. Click a button at the top of each channel, and up pops a little voice edit window; here you can select a patch, and edit it to quite a wide degree. The parameters are largely of the offset variety, but it brings the sound set more into the creative fold than might be expected. Each standard voice offers filter cutoff and resonance controls and a 'character' parameter, plus a three-band 'tone' control. A simple three-stage envelope and vibrato section are also provided (though there's no separate envelope for filter), plus tuning, portamento and mod/pitch-bend response parameters. Individual sends to the global reverb and chorus effects are joined by level and pan controls. A closer look at Sonar 4's new track folders option. The new TTS1 multitimbral sound module is grouped with a number of individual MIDI tracks that are playing it. The drum patches are a little differently specified. Filter cutoff and frequency, along with three-band tone control, are present, but only globally for the kit. Each drum sound in the patch has its own level, pan, tuning and reverb/chorus send parameters. How much more useful if filter settings could be altered for each voice, too. Whether you tweak normal or drum patches, your results can actually be saved, since the plug-in comes with four banks of 128 normal patches and a bank in which to save up to 128 drum sets. Nice touch. It stands to reason that all TTS1 parameters can be assigned to MIDI controllers, for remote mixing or creative automation of parameter changes. The set is, as one would expect from a Roland-sourced sound collection, uniformly useable. There's a stereo piano that might do in nearly all circumstances if you have nothing else available, and which fits pop mixes brilliantly. Roland drums are hard to beat, and the nine sets here cover the standard, analogue and orchestral bases. There's always an issue when it comes to working with 24-bit audio: how to turn the audio into a 16-bit file for general audio CD distribution. Sonar has always handled this easily, and Producer v4 adds the POWR (Psycho-acoustically Optimised Word-length Reduction) dither algorithm, which aims to produce 16-bit files that are audibly indistinguishable from the original 24-bit (or 20- or 32-bit) audio. There are four options, suitable for different types of audio. More sonic improvements are to be had with the implementation of Prosoniq's MPEX time-scaling technology. It helps with the quality of audio that's been stretched or squashed to fit a given space, such as during video editing. Producer also gains new video editing features, with the addition of a thumbnail track. The software can already import AVI, MPEG, WMV or Quicktime movie files, allowing you to edit music and audio in sync, and where a video standard supports surround, Sonar keeps up, so WMV and AVI files can be loaded or saved with stereo or 5.1 surround tracks. The thumbnail track shows key frames at regular time intervals across the top of your track list. Zoom in close enough, though, and you'll see every frame in a video. This track lets you easily line up audio to video events and quickly move to a particular scene when spotting audio to picture. Beware, though: working with video at all places extra demands on your computer, and having thumbnails visible adds to those demands, especially if you do zoom such that every frame is visible as a thumbnail. If your computer can't handle it, show the thumbnail only when you need to spot audio or check something out. Windows 2000 or Windows XP (recommended). 800MHz or faster processor (1.2GHz or higher recommended). ASIO-compatible audio interface (will work with WDM or any Windows-compatible audio interface). Luckily, the Studio Edition has also been enhanced, and the following new features apply to both versions of Sonar 4. Minor but worthwhile changes include background tweaks to the audio engine, improvements in metering and panning (both of which can be user configured to respond the way you want them to), and the option to use computer and MIDI keyboard shortcut routines from other MIDI and audio programs. If you're moving from one sequencing environment to another, it can often be a pain to have to work with different keyboard shortcuts. Now, if you use Sonar and one other package, then you can harmonise the shortcuts, making life just a little bit easier. Meanwhile, the metronome can now be routed to any audio buss, so if you're recording several people, and you have the headphone monitoring flexibility, each player will be able to have their own click at the level they can best play with. More significant additions include the new track folders option. This is a very handy tool, which many may know from Steinberg's Cubase family. Essentially, you can bundle together a bunch or related tracks, stick them in a folder, and close it. This allows you to manage you on-screen space by letting you focus on different parts of a session or mix, without having to work around loads of tracks which you don't need to see right now. A good use for a folder track might be to gather together multitracked backing vocals, or a multitimbral virtual instrument and its various MIDI tracks. There are many ways for Sonar 's track list to become rather busy in even relatively unfussy sessions, making folder tracks a stress reliever and potential time-saver. Note that the MIDI or audio clips on tracks collected into a folder become a sort of composite clip, and can thus be manipulated as one, which is another advantage to the system. Multiple takes, which can be recorded when looping a section of your song, can now be displayed in separate lanes within the main track. Mute and solo options make creating a compiled track from the various takes an easy job. If you like working with multiple takes — something which could be exploited in track folders — there are new take management options which make the job much easier. Several takes can be recorded to one track, and it's now possible to view those takes as sub-lanes within the track. Each take can be muted or soloed, enabling a composite take to be easily compiled. Another great new feature is the updated Freeze function, which now works both with plug-in synths and with effects on audio tracks. The former option more or less instantly turns the audio produced by the MIDI track playing virtual instrument into its audio equivalent. The instrument is retired, freeing up both CPU overhead and any sample RAM used, and offering you the chance to repurpose the audio in ways not possible if it was just being played by the synth. The best news? You can always return to the original MIDI track/virtual synth pairing! Freeze Tracks does the same thing to audio plus any effects, creating a new audio file. The result can also be unfrozen, though be aware that if you destructively edit any frozen audio and try to thaw it out, you may end up with gaps in the audio or performance. Groove Clips are an essential part of many Sonar sessions — it's this way of working that makes the package so great for dance styles of any kind, though working with chunks in the way they're handled by Cakewalk is also good for compiling effects and environment sounds for soundtrack work, and more abstract audio art. It's not quite Ableton Live in immediacy, but it's not far off! The Loop Construction view has a number of enhancements, inherited from the Cyclone DXi: it's now possible to edit pitch, level and pan position for individual slices in a clip, and these parameters have been provided with envelope automation control. It's now easier to place individual markers manually, with an auto-looping slice preview. Bouncing tracks and exporting audio from within Sonar has been made easier with a range of preset controls, and easy naming options for the bounce. Producer also has surround bouncing options, and can import surround-encoded audio. Some features you don't realise you were missing until you are provided with them. In this category, we'll find the option to play back only the selected clips or time regions, plus the option to mute or solo individual clips or regions. It's also nice to see the new nudge command, available either from the keyboard or the menu with user-definable 'nudge' amounts. Slip editing is now available on multiple audio or MIDI clips, too, so you can hide or reveal the end or beginning of several clips at once. Also new is the Navigator pane, which is somewhat like the project overview found in Cubase SX, except that it can be made to appear as a floating window as well as in the main arrange view. As you'd expect, it shows your entire session in miniature, with a mouseable window letting you focus on a given section. This could be a time-saver when moving around large, busy sessions. The new floating Navigator lets you zoom in — by manipulating the yellow window — on any area in a Sonar song, and is especially valuable in large, complex sessions. A version of the Navigator can also be enabled at the top of the track list. As mentioned earlier, until recently I was exclusively a Mac music kind of a guy, making a sideways jump to PCs when I saw how much laptop I could get for so much less cash than an equivalent Powerbook. I got myself a copy of Sonar pretty quickly, as it seemed to have quite a high standing amongst PC musicians. The experience has been interesting. It's a powerful program, with many touches that I find help the musical flow. The way Cakewalk keep on top of plug-in standards is also refreshing: it seems that almost any commercial or free plug-in effect or instrument can be used from within Sonar in some way. There have been some cultural differences to get used to, some of which are Windows-based, some of which are no doubt a legacy of Sonar 's long history. There's loads of choice when it comes to PCs and PC audio hardware, but making Sonar your main platform won't be a move you'll regret. Surround Bridge in action, with Cakewalk's own Compressor/Gate plug-in assigned to a surround buss. Four instances have been created, in order to process each audio channel in a 5.1 surround mix, but all instances are managed from one window. Just below the 'presets' pop-up, you'll see a row of little folder buttons.The sub-page selected lets you customise which instance treats which buss, whether controls are lined, and whether an instance is enabled or not. Note, however, that this doesn't act like a true surround compressor. As for version 4, the environment largely feels the same, though there are enhancements even here, such as with the 'dynamic console' option in the Producer Edition, which offers per-channel EQ and assignable effect send controls. You don't need to open plug-in windows to access these controls. Surround compatibility had to happen, and Cakewalk have implemented it in excellent fashion — I love that surround panner! And a surround-compatible reverb makes me rather want to permanently change my studio to surround monitoring. Other new features are less obvious, if not less useful. Producer users will welcome POWR dithering, and everyone else should find track folders and multiple take lanes to be time-savers and operation enhancers. The new TTS1 virtual synth is worth having, too. There are apparently more than 100 new features in Sonar 4, though many won't be immediately visible — this wasn't a complete redesign, after all. If you're already in the Cakewalk family, then you don't need persuading: you'll upgrade. Recent purchasers of v3 will even get the upgrade for free. That said, if you're still trying to justify your purchase of Sonar 3, especially the Producer Edition, then perhaps you might play it cagey. Version 3.0 (or whichever free upgrade you've taken it to in the last year) is still a top, stable, powerful and fun package that works for the enthusiastic sound hooligan as much as the finicky professional. It's up to you whether your particular situation requires all the extras that have been added to this latest release. Likewise, don't feel you're the poor relation if you buy into the Studio Edition rather than the Producer: that's a huge saving for not a lot less functionality. If you don't currently require surround mixing, don't work with video, and can manage without some of the other potentially esoteric features, Studio will be great for you. Session enhancers such as track folders, multiple take view, bussable metronome, navigator view and so on will be part of your v4.0 upgrade, along with the excellent TTS1 Roland-based sound module. You don't, however, get any version — stereo or surround — of the rather fine Sonitus processing suite, though you do get a copy of Lexicon's fab Pantheon reverb, in 'LE' format. I still sort of wish Cakewalk would port Sonar to the Mac, but as a side-by-side Windows user, I can't complain. This is top software that hits so many musical marks, and Windows users should feel a little smug. You've got to admire the stability and power of the package, and the excellent work and dedication of the development team. Surround mixing for Producer Edition. Folder tracks a great addition. Many enhancements to the music production workflow. Maybe not as dramatic an update as a full version increment might indicate. How often do you encounter software that's this stable and applicable to so many music environments? Not a colossal update, perhaps, but this is a very serious piece of software. Producer Edition £398.99; Studio Edition £199; upgrades from v3 £119 (Producer), £69 (Studio) or £149 (Studio to Producer). Prices include VAT.